When my husband saw the first one I did, he said "I want one of those". 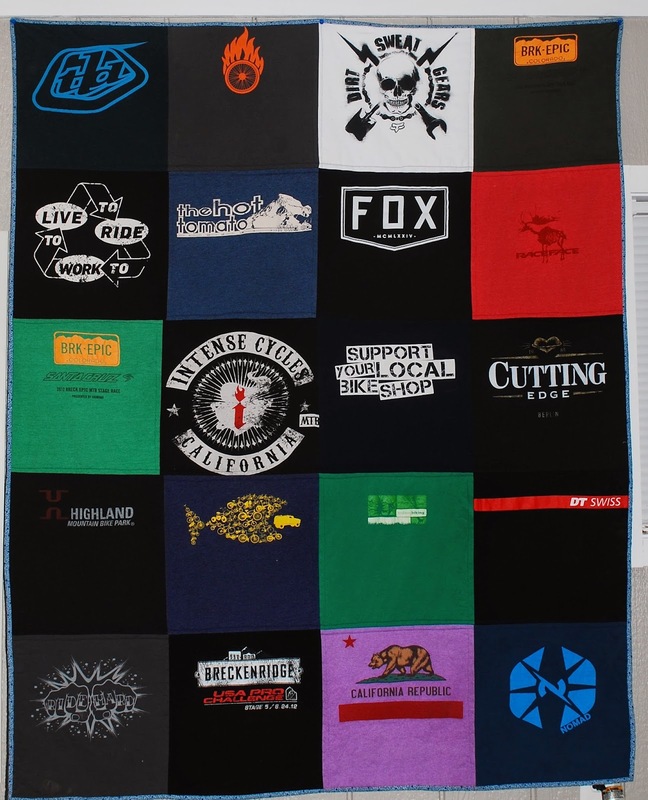 When he saw the one I made for my son, he started making a pile of shirts and said "the only thing I want for Christmas from you is a mountain bike shirt quilt". Of course, with that kind of a request, I had to make it. He originally wanted it to actually use, but when he saw it all finished, he was afraid it would end up with dog hair on it, and it wouldn't get the respect it deserved, so he changed his mind and hung it in his bike workshop. He chose the most spectacular flannel for the back (when he thought that's what would be touching him). It's Northcott Man About Town flannel, and it is gorgeous. Soft, thick, but so easy to work with. The binding almost seemed to attach itself. The most AMAZING flannel on the back. It's to die for. I used a thicker interfacing with his because the t-shirts were all over the place in terms of age and use. Some had been washed a ton of times and some he bought (yes, he did) just for this quilt. So the thickness and texture was really inconsistent. But with the interfacing, they became much more similar and easier to get to line up. It also made the finished product look much more substantial to me. As much as I love giving these as gifts, and I know how much they mean to people, t-shirt quilts are pretty boring to make. Not that I've got my techniques down, they do come together quickly.